So...to help figure it all out I created a mood board and I think I have got it pretty figured out. I found a great cream/black ceiling fixture that I think will go great with the room and I really like the rattan room darkening shade paired with the airy white curtains. The picture of the window treatment was lifted from a picture at the bottom of this post over at Young House Love. So now I am questioning myself on the table lamps. The hubs and I have two different bed side tables...a product of one of us (who shall remain nameless) who is obsessed with having everything as close to the walls of the room as possible deciding he needed a bed side table, but not one as big as mine...so they are the same exact style...but mine is about 20% bigger than his. ...so what do you think...should I go ahead with the mismatched lamp idea or not? And it is crazy of me to have such mid-century modern lamps in the room with other details that fall to the more classic side? And what should we do with the great big expanse of wall to the right of my bed? It isn't above the bed, it is on a free wall...so how do you anchor it? Lastly...our bed is up against the two windows (and that is where it will stay)...so do we put full window treatments on both windows or do we do half on each and try to frame out the bed? Would that look unfinished? Oh how I wish I was more confident and could just TELL the husband what we are doing instead of feeling like I need to convince him. I really like your idea :) I think if you did the treatment on half the windows that would look fine b/c from the looks of it your bed covers part of that window (so I assume it covers part of each window). 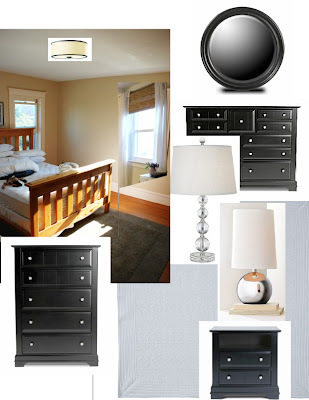 I think the window treatment your thinking of would go really well w/ your colors and the black dressers and tan bed. I also totally agree w/ the different lamps. With the two different sized side tables, the lamps should be different to even out the sizes. I can't to see pics of the finished product! Love the window treatments! I think you should just do half the window, it will frame the bed nicely. I think you should paint the bed black. Of course, that comes from a person who is obsessed with all the furniture being the same color. The lamps, I think different lamps are great, but I'm not sure I would put a bigger lamp on the smaller table. I think it will make that table look smaller in comparison to the bigger table with a smaller lamp. I would also do window treatments on the far side of each window to balance everything out. We have different lamps and I love them, and do you think you could sand and paint your bed? I agree that that would look awesome. As for the curtains, my gut would to hang some luxurious curtains over the whole wall. Check out what 'Young House Love' did with curtains behind their bed.But then again just shades in the windows would work too. As for anchoring the wall- could you do a mosaic of pictures- that way you don't need a huge art piece.